Client: Should I bid on my brand terms? Client: But why should I pay for brand terms when I already rank #1 in organic search? Won’t customers find my site through my organic SERP listing? LP: Maybe, but why would you take the chance? Some clients have a difficult time moving past the idea that branded paid search is a waste of money and that as long as organic is performing well, it just isn’t worthwhile. I’m here to tell you that a) this isn’t true and b) it’s time to start thinking about branded search in a more strategic way. You might think, “Hey, wait a second … ‘wild feminist shirt’ is not a brand term; however, it definitely is because it’s synonymous with the brand. Product names or product categories are included when they fall under this umbrella. Now that we’re on the same page when it comes to brand terms, let’s dive into the top 5 reasons (in no particular order) why you need to bid on them. 1. If you don’t, someone else will. The space might be free of paid ads now, but if your competitors are smart, they’ll see that you aren’t bidding on your own terms and will swoop in and take advantage. If you could prevent someone from stealing your traffic (especially potential new customers), why wouldn’t you? If competitors, resellers, or affiliates are already bidding in the space, then your involvement is an absolute no-brainer. Unless you want customers to only shop at resellers, you absolutely need to buy ads to remind them that you exist and have something better to offer. 2. Brand terms are cost-effective. They might not exactly be cheap, but they’re definitely cheaper than the broad, non-branded terms you might use for prospecting. Also, ROAS (return on ad spend) is high, sometimes netting you as much as 10-12x back on your initial investment. If you’re a new brand with a limited amount of search volume, you will probably struggle to spend money and won’t see a crazy high return at first, but clicks and conversions will start to grow as you build the brand. In this instance, branded paid search can actually act as a barometer for the success of your other strategies. If you continue to monitor it, mine your search query reports for new terms, and optimize, you will see incremental success over time. 3. You have full control over brand message. Sure, there are organic strategies you can employ to try to control SERPs (defined meta descriptions and page titles, structured markup), but search engines don’t always abide by your wishes. Perhaps you’re running a sale that you really want to tout in your sitelinks. The sale link might show up in SERPs, but it will definitely show up in paid search if you set it as a sitelink extension. The same message holds true for landing pages. Maybe you’ve built out a really beautiful landing page for bestselling products, but you’ve noticed that organic searches don’t always direct users to it, even when it’s relevant. If you’re running branded search ads, you have the ability to control the first thing users see when they reach your site. 4. Dominating SERPs is always good. The more listings you have, the more likely it is that a user will reach your site. If you are running shopping ads, paid search ads, and have a high-ranking organic listing, you’re in a great position. According to Moz, “searchers who see an ad may be more likely to click on an organic listing, or they may be more likely if they see a high-ranking organic listing for the same ad to click that ad.” In other words, ad presence can increase organic search click-throughs. The good news? Google charges for clicks, not impressions. 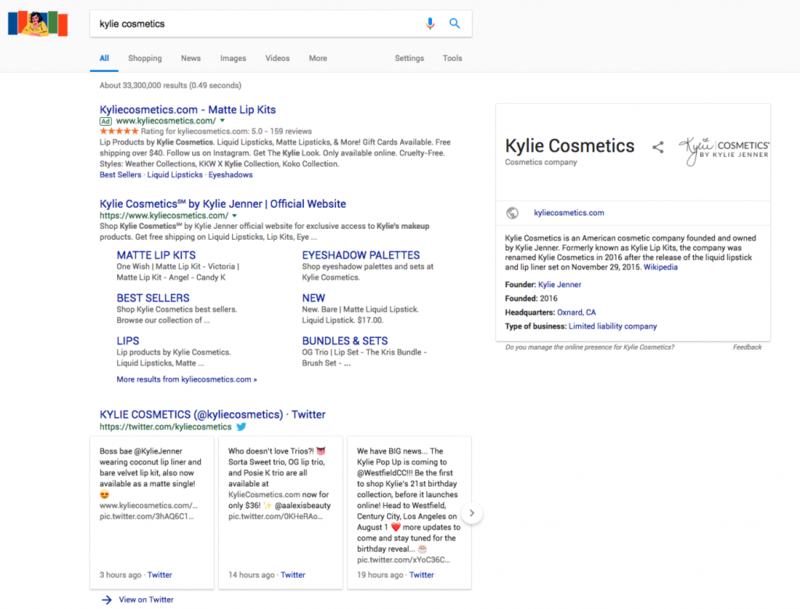 Imagine this scenario: a user sees your paid search ad at the top of the page and is then reaffirmed that your brand is legit when they also see a top-of-page organic listing. The user then clicks the organic listing and buys something on your site. While this paid search listing impression cost you nothing, it directly impacted a user’s decision to click and buy. Why wouldn’t you want this? 5. Bidding on brand terms increases overall traffic from search engines. Everyone will tell you that spending money on ads doesn’t directly increase organic rankings, but what about indirectly? A 2012 study from Google plainly states the facts: “89% of the clicks from search ads are incremental, i.e., 89% of the visits to the advertiser’s site from ad-clicks are not replaced by organic clicks when the search ads are paused.” In other words, those people who think that they don’t need to pay for brand terms because organic search makes up the slack are wrong. You might be skeptical of a 6-year-old study, but I can tell you that I’ve experienced this behavior firsthand as recently as last month. Whenever branded paid search ads are paused, we always see a decrease in organic search. If you don’t believe me, check out this 2018 study from CPC Strategy. If you made it to this point and are still a skeptic, all I can suggest is that you give branded search a try. Set up a campaign and run ads with a modest budget for a few months while also monitoring your organic rankings. If you don’t see a decrease in branded organic search terms after pausing paid ads, please send me an email at [email protected] and tell me how wrong I am.